DVD ripper is widely used to extract data on a DVD disc and store into another format for further editing, backup, sharing or playback. If you have a collection of DVDs, you might be looking for a good free DVD ripper program. Even though it is hard to define a good DVD ripper and some features are always not available in free DVD rippers, we pick up the most popular and practical free DVD rippers and give them a thorough review for Windows users. DVDSmith Movie Backup is a desktop-based free DVD to DVD folder converter. The free program is specially designed to decrypt commercial movie and TV series DVDs. It allows users to convert DVD to DVD folder for playback without the original disc. Two clone modes, Full disc and Main Movie, are available within the program. You can find a 3-step instruction on the interface when you open the program. We tested 30 movie DVD discs with the DVD Backup program and it can convert 26 of them successfully and completely into DVD folder. Pros. : 1. DVDSmith Movie Backup is able to remove various DVD protections from movie DVDs. In other words, it is a free DVD ripper that can process protected DVDs. 2. The interface of the DVD ripper is rather straightforward. Even the beginners can use it at the first sight. 3. The DVD backup program can decrypt the latest movie DVDs. Cons: It only supports DVD folder output. Overview: If you have collected a lot of movie DVDs or TV series and would like to backup the DVDs, DVDSmith Movie Backup is a nice choice. 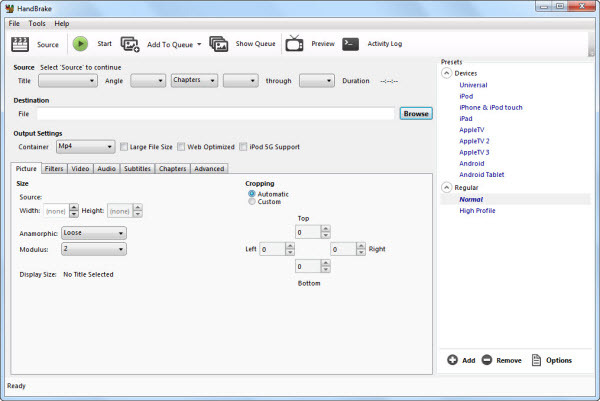 Handbrake is a free and open source program which can operate on multiplatforms. 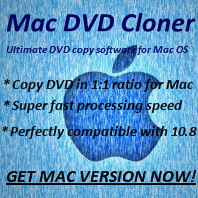 It is not only a free DVD ripper but also a video converter. You can find a lot of features that are provided only in paid version for other programs in this DVD ripper. For example, you can choose a profile optimised for your device, or choose a universal profile for standard or high quality conversions. You can also select the needed title or chapter. * Supported input formats: most common multimedia files, unprotected DVD. Pros: 1. It supports multiple input formats and output formats. 2. It can operate on Windows, Mac and Linux Operating Systems. 3. It gives users full control to the output video files with lots of customized options provided. Cons: 1. Handbrake cannot convert protected DVDs discs. 2. The output video quality is not always satisfactory. Overview: For people who would like to convert unprotected homemade DVDs, they can take shelter to Handbrake. Some features are quite useful and provide great convenience for users. WinX DVD Ripper is a 100% free and clean desktop-based free DVD Ripper. The interface is user-freindly and suits beginners quite well. After we click DVD disc in the free DVD Ripper, the program will analyze the structure and preview the movie automatically. We can choose different output format and customize the parameters for the output video. * Supported input formats: DVD folder and DVD (both protected and unprotected, except Disney protected DVDs). * Supported output formats: MP4, MPEG, H.264, WMV, FLV, MOV and MP3. Pros: 1. WinX DVD Ripper is free and works for both protected and unprotected DVDs. 2. It supports multiple output formats and converts faster than Handbrake. Cons: It cannot decrypt Disney protected DVDs. The feature is only available in paid version. Overview: If you are a beginner or you do not know much about DVD ripper, you can try WinX DVD Ripper. It is easy for operation and it works. DVDFab HD Decrypter runs as a stand-alone program on a user's computer. Works as a free DVD decrypter, it can remove protections from old DVD discs. * Supported input formats: DVD discs, DVD folder and ISO image file. * Supported output formats: DVD discs, DVD folder and ISO image file. Pros. : 1. DVDFab HD Decrypter can convert protected DVDs and copy DVDs to hard drive. 2. It converts DVD to Video TS folder fast. Cons. : 1. It cannot deal with the newest DVDs. 2. It can only convert DVD to DVD folder or ISO image file and lack of commonly used output videos such as MP4, WMV, MPEG, etc..